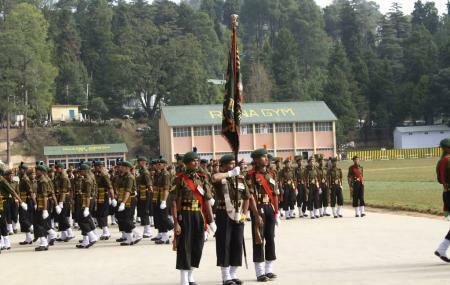 Find hotel near Kumaon Regimental Centre .. The Kumaon Regimental Centre Museum and Memorial was constructed in Ranikhet in 1974 and stands as a symbol of bravery of the Indian Army. The museum was added to the memorial in 1978 to preserve and exhibit the legacy and customs of the Kumaon Region. The Kumaon regiment is well known for their bravery and selfless acts of valor during battles, and this memorial stands as a testament to that fact. The museum also showcases valuable treasures like Rani Jhasi's silver sceptre, a number of Chinese rifles that date back to the 1962 war, a World War II Japanese wireless field telephone as well as some important documents pertaining to the Kargil War. It also displays memorabilia from past regiments, traditional costumes worn by men in the regiment, armour worn by the soldiers in past battles as well as medals won, among other items of historical significance. Ask locally for exact timings and plan a visit accordingly. Open on public holidays and throughout the year. Taxis ply to the museum. Well-connected by a motor road. How popular is Kumaon Regimental Centre Museum? People normally club together Katarmal Sun Temple and Govind Ballabh Pant Public Museum while planning their visit to Kumaon Regimental Centre Museum.